I can’t think of another time I’ve been excited about a small sheet of metal! But, as someone who loves cooking but who doesn’t generally use a lot of gadgets, I’m seriously impressed with my new Pizza Steel. It came with two ‘slides’ – fine stainless steel sheets that you use to slide a pizza or bread on and off the steel itself and with a dough cutter. So, for the first time in ages, I’ve been making pizza! And, I really do love homemade pizza! Like most people, I love a good pizza. And, I particularly like to be able to choose my own toppings. I’ve been making home-made pizzas of one sort or another for around 30 years now(! ), although in the early days I used to use a scone mix rather than pizza dough – something that really doesn’t give a comparable result. As I’m generally cooking for one or two, making pizza dough can seem like a bit of a faff, but I’ve found an easy solution, in the form of the freezer. 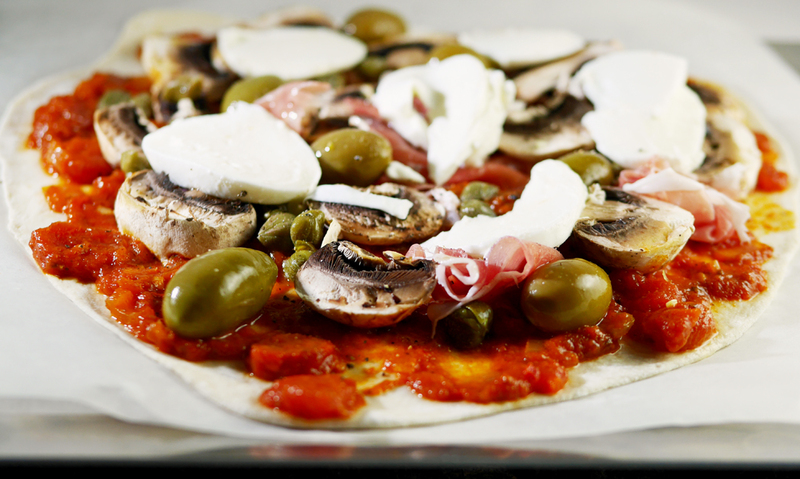 I didn’t realise that it was possible to freeze uncooked pizza dough – it is, and provides me with the perfect way forward. You simply let your pizza dough rise as normal, then pop the ’rounds’ into flour dusted freezer bags, or alternatively coat the dough with one-cal oil spray or with a little olive oil. When you are yearning for a pizza, take out a portion of dough, let it thaw out in the fridge and then in the kitchen for 30 minutes or so, then stretch or roll as normal into a round. So now, equipped with a little more knowledge and a fabulous Pizza Steel I am happily making my own ‘Perfect Pizza’. I like a thin, crispy crust pizza. I can’t do the fancy dough stretching that you’ll see in an Italian restaurant. Instead, I dust a piece of silicon paper with flour and use a combination of stretching the dough with my fingers and cheating with a rolling pin to get that paper-thin dough. I am rather impressed with my new Pizza Steel. My Neff oven does have very impressive heat settings (it’s a fan oven with a range that goes up to 275C), but the real advantage of the steel is that it helps give an even bake to the crust – no more soggy bottoms here! Here’s my latest work of art and the recipe for making your own pizza. It is something where I’d encourage you to be as creative as possible – I know that personally, I like to include a good tomato sauce and some mozzarella cheese. That apart, I mix and match toppings to my own taste and with a mind to what happens to be in the fridge. Turn the dough out onto a floured board and knead for 10 minutes. Take one ball of dough and press it down in the centre of the square. Keep working it into a flat roundish base, using your fingers to flatten it as much as possible. Push the slide under the pizza and silicon paper and then add the toppings, starting with enough tomato sauce to <g class="gr_ gr_156 gr-alert gr_spell gr_inline_cards gr_run_anim ContextualSpelling ins-del multiReplace" id="156" data-gr-id="156">lighly</g> cover the base. 1/8th of the pizza dough will make a pizza for one hungry adult or 2 kids. Any left over tomato sauce can be frozen or stored in the fridge for a few days. Although the recipe sounds complicated, it’s really not. And, it has the benefit of being infinitely variable. You could even do a pissaladiere – a French take on pizza with a lot more onion, anchovies and olives, but not a single tomato or an ounce of cheese. What you do need to make any of this work is the Pizza Steel. It’s a 6mm thick, 6.5 kg slab of carbon steel that stores and leads heat energy 20 times better than stone. 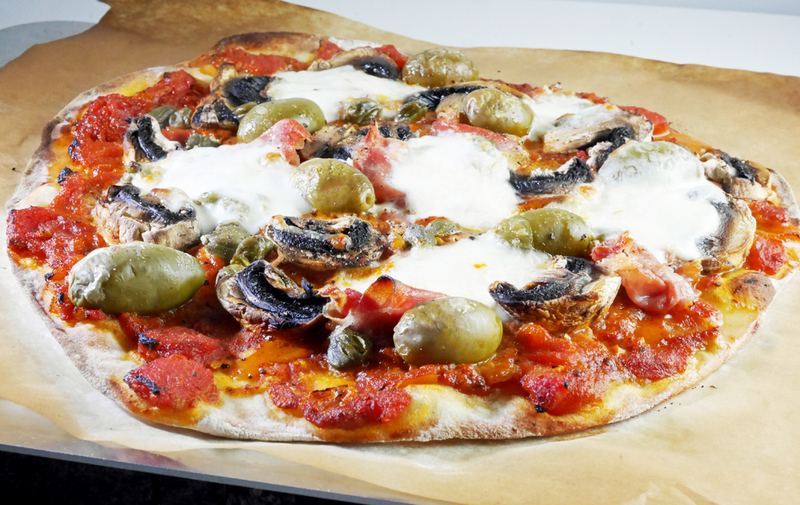 Unlike traditional pizza stones which have a tendency to break, the pizza steel is virtually indestructible (it comes with a ten-year guarantee). The steel takes between 30 and 45 minutes to heat up, so just enough time to whip up a batch of homemade pizza dough. The Pizza Steel comes equipped with 2 slides or ‘combi peels’ so if you were trying to feed a family, once the first pizza was in the oven, you could start to load up the second one, ready to pop in for 10 minutes. The combi peel is a 1 mm thick hardened aluminium designed to match the steel perfectly. It’s the ideal surface for the final proving of dough. 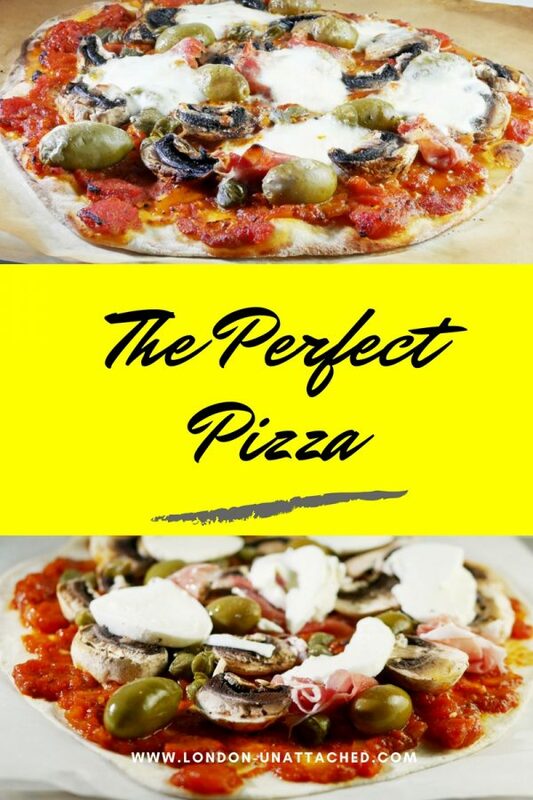 Simply cut a piece of baking paper the size of the peel and allow your dough to prove on it, and use the peel to slide the baking paper with the risen dough directly onto the pizza steel. It also acts like a pizza peel/bread paddle, meaning you can easily slide your prepared pizza onto the steel for baking. It works equally well for cooking bread rolls – you get a lovely crust because the heat of the steel is so well distributed. And, it’s almost unbreakable and very easy to clean and maintain – you just wipe it clean and pop it back in a warm oven to dry. Season it from time to time with a little olive oil and it turns a lovely matt black with a perfect, naturally non-stick surface. Such a gorgeous recipe with lovely ingredients – thank you. Thanks for a fantastic recipe. Real Italian Pizza is so different from American or British Pizza; much more refined and cultured and like all good Italian food appears simple hiding the expertise that it takes to produce it.. This is a great recipe and helpful pointer to making for yourself, but it will never be quite the same as that produced by a genuine Italian cook. Love homemade pizza. I always have dough in the freezer. Never tried pizza steel but Is like to. I make my own pizza from a very similar recipe to yours, but “soggy middle” keeps being a problem, especially when using moist toppings. I’ll definitely be looking out for a pizza steel – thanks for the suggestion. This really does make a big difference. I’ve just left my pizza steel in the oven, it makes a good oven liner too!